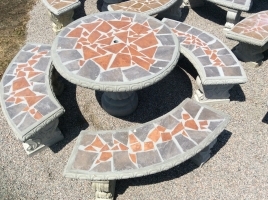 Specializing in Outdoor Patio Tables! Let us provide you with the best Patio Table around! Built to last, these reinforced Outdoor Patio Table Sets will provide you and your family and friends with years of outdoor enjoyment! 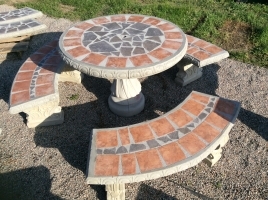 Several sizes available to fit any outdoor seating area along with several different color schemes to fit you outdoor décor! Take a look at all of our different Patio Table Sets in our Online Catalog and please contact us with any questions. The Cement Barn, is a family owned and operated business located in Southeast NC. We proudly cast all of our Concrete Statuary onsite. We offer our products to the public as a Retail Operation as well as a Wholesale Distributor for Stocking Dealers. We Retail all of our products from our location in NC where our products are manufactured. We welcome you to drive down and browse around our 5.5 acre lot where we stock all of our items. Also our showroom sales floor is stocked with items in several of our Painted Finishes as well as our popular Acid Wash Finishes. The Cement Barn’s Wholesale Policy is for stocking dealers only where our products are displayed in your store and resold. If you are looking for a Distributor of Quality Concrete Statuary to help supply your business with Concrete Products please read over our Wholesale Policy as we will be glad to work with you in the future! The Cement Barn’s Concrete Products are cast out of quality materials which produces a quality product that you will enjoy for many years. 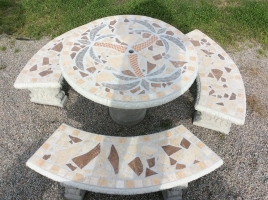 We offer an assortment of Concrete Statuary as you will find in our online catalog, such as Birdbaths, Fountains, Benches, Patio Table Sets, Stepping Stones, Angel Statuary, Planters, Animal Statuary , Steps and so much more! We proudly ship our products all across the U.S.A and shipping is available for all of our products. See Shipping Information to learn more about shipping. We proudly manufacture over 1,500 different items. Our Online Catalog has our items listed with photos, sizes, and prices. If there is a particular item that you are searching for that is not listed in our catalog, please Contact Us and we will do all we can to help. This Cement Fire Pit is ready to help you enjoy the outdoors during the fall and winter! Get Yours Today! This Sectional Interlocking Concrete Fire Pit is an awesome addition to your landscape. Many homeowners are using fire pits for warmth, entertainment and cooking, or as focal points for an outdoor living space. This Fire Pit is perfect for sitting around during the Fall and Winter. Kids and adults all enjoy spending time around a fire plus its a great way to enjoy the outdoors. Not only does this Fire Pit serve the purpose of having a fire to hang around, it can also be used for grilling! Whether it is Marsh Mellows, Hotdogs and Hamburgers, Steaks or Pork Chops, Chicken, or even a stew, lay a metal grate across the top and grill your favorite meal over hot coals. This Concrete Fire Pit is easy to install and takes just minutes. Pull up some chairs, kick your feet up and enjoy the fire with family and friends! A Concrete Water Fountain is a great addition to any landscape. Not only are they a great focal point for the yard, fountains add the relaxing sound of running water that adds life to any Patio and are also Bird friendly! Here are a few of our featured multiple tiered water features we are showcasing for the summer! These 12″ Gazing Balls come in an assortment of colors! Here are a few of the most popular colors. Displayed on a Concrete Gazing Ball Pedestal from The Cement Barn’s Concrete Statuary! Be creative and create a stunning walkway by mixing up sizes with our Round Paver Stepping Stones! Available in 12″ Round, 18″ Round, 24″ Round, 32″ Round, and 36″ Round, The Cement Barn has exactly the products you need to create whatever size, shape, or design of walkway or patio you have in mind for your next project! Our Retail Greenhouse Blooms in the Spring & Summer! The Cement Barn’s Garden Center has two Greenhouses where we grow a wide variety of Annuals and Perennials. We offer beautiful Hanging Boston Ferns, Kimberly Queen Ferns, Mixed Container Baskets, Bougainvillea’s in several colors, Bedding Plants, and also a huge variety of Vegetable Plants for your garden! Whether you are working in the yard or out in the garden, The Cement Barn has you covered. Our nursery has pretty Crepe Myrtles in various sizes and colors, Daylilies, Hasta, Lirope, as well as nursery stock for a flower bed or to plant around your home. We also stock clean Long Leaf Pine Straw year round! Stop by today! Be sure to like our Facebook Page to stay updated!